Trendslide is a mobile business intelligence solution designed to bring you the most important trends in the palm of your hand. Business is no longer tied to your desk. Trendslide allows you the insight to make smart, more efficient decisions to help your business achieve results. There is no large software installation to roll-out or specialized IT resources needed, with existing support for your data sources Trendslide easily integrates with your business information, simply select the sources you would like to integrate and start getting your trends in 2 minutes. Users need a way to get their actual analytics on the go, and not just a static email. 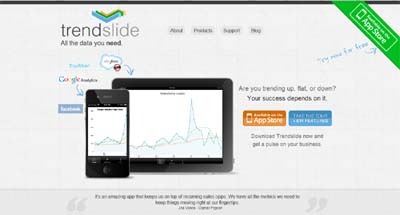 In addition, Trendslide was designed from the ground-up to be a mobile platform, it was not an after thought. As such we can deliver information to you when you need it, where you need it.